Our aim at Challenge Trophies is to offer you good value at a time when you need it most – offering cheap skiing trophies in July isn’t the way we do things!! We’re coming towards the end of the football season and our selection of trophies contain lots of budget trophies for your end of year presentation. 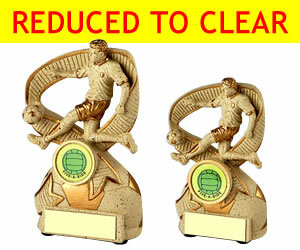 On top of that we will be introducing special offers and clearance trophies throughout the coming months. The first of these are a pair of sandstone resin football trophies, showing a footballer and ball. The large one is being sold at £5.45 and the smaller one is at £3.95 – they are great value and will grace any presentation.